The Fisher-Price Little People Disney Princess Songs Palace is a great toy! The Little People series is always a big hit with the youngsters and this is of course combined with the ever popular Disney Princesses. 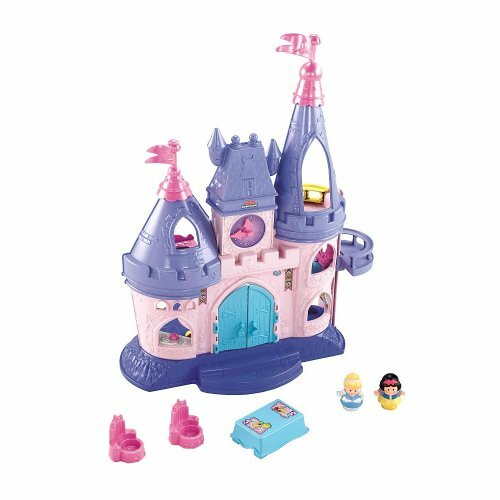 The Fisher-Price Little People Disney Princess Songs Palace is a truly interactive toy which will give your child endless hours of amusement and imaginative play. There are 6 play areas in the Palace – a Sitting Room, Kitchen, Bedroom, Balcony, Attic, Dressing Room and Magical Dance Floor. One very cool feature is that if your child places a Princess on the Magical Palace Dance Floor it will recognize her and responds with her name, character phrases and a sung song from her movie. It arrives complete with Snow White and Cinderella figures but you can purchase more Princesses (Ariel, Tiana, Rapunzel, Aurora, Jasmine and Belle) to add to the collection. There are even more interactive features too. When the Palace doors your little one will hear a fanfare. Push down on the tea kettle in the kitchen to hear whistling sounds. Children love these kinds of features! The suggested age range is 18 months to five years. The Fisher-Price Little People Disney Princess Songs Palace has excellent customer reviews and is rated with 4.5 Stars on Amazon with over 300 reviews.